Add the oil to a small saucepan over medium heat. Add the onions and serrano pepper and cook for 2-3 minutes. Add the garlic, Clam Base, and diced tomatoes and cook for 30 seconds more. Stir in the cilantro. Pour the sauce over the steamed clams. Add 2 inches of water to a large stockpot and bring to a boil. Add the clams to the water. Cover and steam for 4-5 minutes. 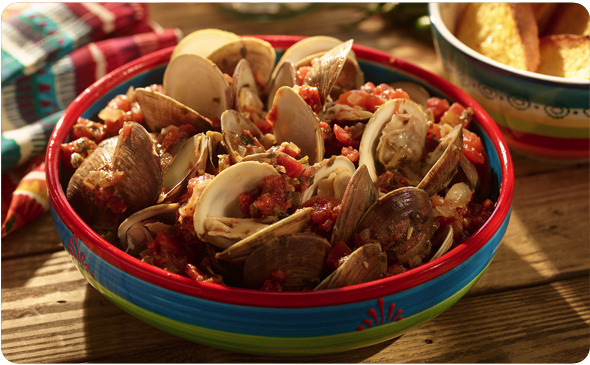 When the clams have opened remove them from the pan to a large serving bowl. Discard any unopened clams.